Patikan - 100 caps - Relieves cough with phlegm. 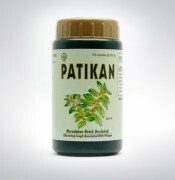 Patikan also serves as an anti-inflammatory, laxative urine (diuretic), eliminating the itch (antipruritic), mild sedative. •Glicosida flavonoid especially in patikan can work as an expectorant that can stimulate expectoration. •Phenolic compounds, flavonoids, saponins and terpenoids have antibacterial activity that is able to inhibit the growth of bacteria that cause coughing up phlegm.